I have a Friend that lives in England....Lucy is getting married at the end of this month. Since she is a stamper I wanted to make her a Special card...I Really do not have many Wedding stamps here with me. 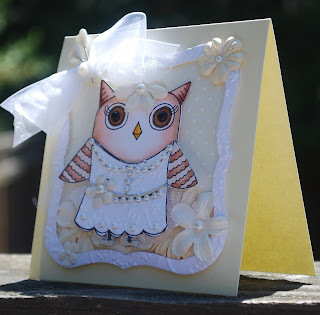 Then it dawned on me, It would not be from me if it were not an Owl so I made her an Owl Bride Card. Here is my card to Andy the groom!! Lucy and Andy I wish you much Happiness and a Lifetime of Love.....Congratulations! I Submitted this for the Caardvarks challenge this round since it is to make a Baby or Wedding Card. Kelly - how just like you. I love them both and I'm sure Lisa and Andy will too. You are so clever with dressing up your owls. Both owls are so cute. She will really enjoy your cards. OMGoodness, I think this is just about the cutest thing I have ever seen! These are so creative and totally wonderful! Oh what a wonderful pair of cards for Miss Lucy...beautiful, Kelly! You totally ROCK, Kelly!! I think this is what I said every time I looked at your cards. :) You are so talented, I'm speechless!! You are so clever Kelly!! Love how you've turned the owls into the bride and groom!! I just know Lucy is going to be thrilled with these! love mr & mrs owl! Lucy IS totally thrilled. One of them is PROUDLY on display on my mantelpiece and will be staying there for a LONG time. Kelly, these cards are wonderful, so special, detailed and gorgeous, and you have made me so so happy. Thank you for your well wishes too, I'm so excited now. One week tomorrow!!! YAY! So adorable! What a great set of cards! Owl couples! Love the attention to detail. 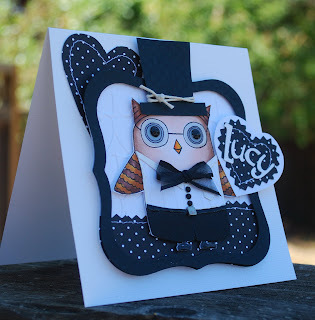 Aren't you clever ... love your fabulous bridal attire ... fantasztic wedding cards (and so perfect for Lucy). oh my gosh! those are just *TOO FLIPPIN' CUUUUUUTE*!!! and totally gorgeous, as well! yikes! sooo clever and ♥FABULOUS♥! Those are both adorable, & the detail on the Bride card is amazing! These owl cards are so cute! So clever of you how you made them into a bride & groom. Boy oh boy those two cards are a hoot. Kelly these two cards are just darling :D. I bet that the lovely Lucy adores hers. These are AMAZING! I really think you outdid yourself here on these ones. Just stunning! My goodness Kelly your owl's bride and groom looks so gorgeous.. LOVE it! !